It’s been another busy week around here, despite a few disruptions. For those who followed my 6 month long house hunt/purchase last year, you know that I wanted a new deck built off my office even before I closed on the house in Sept.
Well, the guys showed up unexpectedly this past week and that threw a bit of a monkey wrench into my schedule for balancing work on BlogAid and Heartwood Art. But, I’m thrilled to say that the deck is nearly done and just in time for the early spring we’re supposed to have. I practically live out on the deck all year round and having a covered, semi-wind shielded place to be that looks out over a wooded lot with all the critters will most definitely help reduce my stress level. And I’ll take all of that I can get!!! So, I didn’t complain about the disruption, as having that deck will improve my quality of life. I got nothing you can see done with the wood site this week. Either the deck workers were making too much noise or the weather was too cold to be in the shop or the times where neither of those things were happening I had other things scheduled. But, that’s not to say that I got nothing done. I did my first video shoot last week on a beginner type tutorial for setting up a circular saw, and put it up privately on YouTube for a few of my peeps to see in an effort to get suggestions for making the lighting a wee bit better. I also looked at a LOT of YouTube videos for similar tutorials. Most of them are just awful for light, sound, and delivery. Yet, they have anywhere from 10k to 800k views. The fact is, folks searching for that help don’t care about slick production. They care about getting the info they need. So, I’m going with what I have and I’ll improve as I can. I’ll be back in the shop making that final video by this weekend, I hope. Y’all may recall last week that I got my first lumber delivered with the help of one of my sweet neighbors. I spent a little time this week actually playing with layouts on a couple of builds, and boy did that ever help! Working with drawings is one thing. Working with the actual wood is something else, and it really let me try out different ideas in a whole other way. I now have the idea locked down for a rolling tool caddy build. And, I completely changed my mind about the rolling wood storage build, mainly from wrangling ¾ plywood sheets by myself. You will never believe where I got the inspiration for the new layout!!! I hope to get on that build by the end of the month. But, my next project will be doing tests on recording video for a build. That’s a much wider shot and will just be y’all watching the build without me stopping to explain each thing. I’ve seen similar videos where folks did narrations over the final cuts, and that’s what I think I’ll be doing with mine. And it will be fun to play with speeding up the video or doing creative editing to make them way shorter. So, I’ve still got a lot to learn and test with the video part of all this. But, that is time well invested, as it will make everything that comes after mostly cookie cutter and way faster. And, I plan to take stills from that full video and make super short clips to draw interest on platforms that require short vids too. So, lots of repurposing to learn as well. Here’s the thing. Video will be a HUGE draw for my niche. It’s worth every moment I spend learning to do this well. I see a LOT of my clients missing this big opportunity with video and I hope to inspire y’all by what I’m doing with it. And I’ve got news on that front in the SEO Tips section later too. As y’all know, I’m dipping my toes in the Instagram waters with the wood site, and I’m having a lot of fun. My buddy Denise Wakeman has called on her photo mentor to do a free webinar on taking better pictures with your phone. It’s at the same time as my DIY SEO workshop, so I won’t be attending live, and that’s okay, as there will be a replay. So y’all go sign up for that. Woohoo!! I’m delighted to say that I finished the tests on all of the free social share button plugins on my list. Please let me know asap, as I want to finalize my report later this week. There are some very clear winners, and a couple of plugins to just run as fast as you can from. This week I’m testing all of the Pinterest-only type share buttons/methods. I’m also waiting on all the premium plugin devs to get back to me on whether they want to sponsor these tests. In return, they will get full access to the entire case study data. Otherwise, I’ll need to buy a bunch of plugins I don’t need otherwise, but I will do that. Lots of these free plugins have a paid version available, and I’ll only be purchasing those that did well in the tests on the free version, so that will narrow it down a bit. 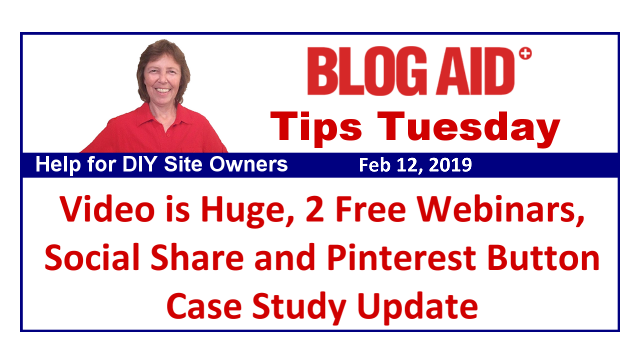 I’m thinking that I will split the case study blog posts into the best free plugins, and then the best paid plugins. That way I can get these out sooner to you as well. And, I can officially announce who will be joining me in this case study for the Pinterst part. It’s Kate Ahl of Simple Pin Media! Her team invited me to be interviewed on her podcast, and I asked for a delay until I could get this case study completed. They agreed that this would be a super introduction for me to her peeps. I’m also relying heavily on my Site Audit Plus clients to help me get started on the tests, as they have tried just about every Pin It method available. In fact, they are providing the initial test list of plugins, and pointers on what’s so great or terrible about them, plus tips on their functions. While I’ve got the test sites set up, I’m also going to be testing several themes to see how well they perform right out of the box for both speed and SEO. I’ll definitely be doing a handful of Genesis child themes and then will move over to Divi. That case study is really going to help my Webmaster Training peeps create fast sites for their clients. We will also be looking into ADA compliance and what it takes to make them fully Gutenberg functional too, but that will be later, toward spring. The next case study on my list will be for contact forms. Those are not so much about speed, initially, as they are about function. Some form plugins really chew up the database needlessly and create a GDPR related issue doing that too. They hold way more info in the database than most of us need. Others, like Contact Form 7, load their JS and CSS files on every page, even those that don’t have a form. And that’s a speed issue. So, those are the kinds of things I’ll be looking for. I’m dedicating 2019 to doing as much testing as I can to help us all use THE best plugins and avoid the ones that cause issues. I would like to make BlogAid THE clearing house for getting plugin advice. We need info that focuses as much on function as on fashion. And I hope to make BlogAid that resource. I also hope to provide more tutorials on the best plugins too. But, there is a problem with doing those, as WP and interfaces and such change all the time. It’s a LOT to keep updated, especially if I’m not using the plugin myself, but many of my clients are. So, we’ll see how it goes with the tutorials. I’m not kidding when I say that video will be a big part of my traffic on the wood site. Google is promoting YouTube videos in search in a big way now. Take a look at the new video grid for mobile they are tinkering with. Note the search is set to All, not video. Now, SEO to get videos to come up high in regular search results is different from the way you do SEO directly on YouTube. And I’m seriously considering making a new course on both. I want to have proof of concept beyond BlogAid for that, though, and the wood site is the perfect candidate. A bomb was dropped at YoastCon last week. Joost de Valk announced that they will now include a way to get your new posts indexed immediately by both Google and Bing. Here’s the thing – this feature is not exclusive to the Yoast SEO plugin. Google’s John Mueller said so, specifically in a recent tweet. And, we already have pings to let search engines know when we have a new post. So, I’ll be digging into this to see what makes this live indexing different from regular pings. I’m also going to dig into it and see if it will help us get super old 404s and other junk links de-indexed and tell Google to stop trying to look for them. You know, like setting something to a 410 should be doing for us already? The new Google Search Console interface is just too littered with useless info like that. I don’t want to see a fresh crawl filled up with stuff I deleted last year and meant for it to be gone from search forever. And I don’t want Google using their limited recrawl budget for my site on such nonsense anymore either. It’s such a total waste of time for everyone. I’ll be revealing what I find in the DIY SEO course as soon as I have it. And this will likely turn into a bonus workshop, which is the very reason I don’t assign dates to the workshops too far in advance. We just finished up all the Technical SEO workshops in the DIY SEO course, and we took a break last week to let everyone get caught up. Good thing too, as the deck guys were working and making noise just outside the office on Thursday!!! We are about to change gears and start our on-page SEO workshop series. We will be meeting this Thursday, the 14th, for that first session. It’s never too late to jump into the course. All of the video tutorial courses are always available. And replays are available on all workshops too. So, you can jump in anytime. There’s always something happening with SEO and you’ll be right there when it does to catch the news and see how to use it. “OpenShareCount, the third party Twitter share counts platform that replaced the old third party platform, NewShareCounts, seems to have also shut down. If you have seen very high loading times for your posts and pages, this might be the cause. We strongly recommend you to create an account with TwitCount if you wish to continue having tweet counts. Displaying share counts slows down your page load speed, even outside of this issue. Holding the count info is a GDPR issue. The counts from all networks have not been accurate in over two years. Most plugins don’t aggregate HTTP and HTTPS counts, so the accuracy is super off since you had you site converted to HTTPS. It is no longer true that showing share counts encourages more shares. In fact, quite the opposite now, especially on super high share counts. So, outside of your own vanity, why are you still showing counts on your site? Get rid of them already!!! You’ve got way more reasons to tank them than to keep them now. Carrie Dils has been teaching Genesis stuff for a long time. And she is the guest on a webinar coming up on Feb 27 for future-proofing your theme. I think that’s worth every designer’s time to check out, regardless of theme framework used. It’s going to be some awesome Gutenberg info too. I’m pretty shocked to hear this. Genesis put together a new Shapers consulting team a few months ago. These are a more diverse set of voices that will literally help shape the future of Genesis design. They had their first meeting in January and one of the things that came out of it was a consensus that Genesis needs to do a better job of making integration and updates easier for 3rd party builders like Beaver Builder and Elementor. One of the things I have always loved about Genesis was the sleekness of the code. It’s a fast theme framework. And these builders just add bloat that slows everything down. You can read more on the conversation, and who drew the same lines in the sand I’m making here with regard to what road Genesis might take in the near future, especially in light of Gutenberg and all the options that Blocks now give us. Honestly, I think the new Blocks coming out every day spell the death of 3rd party builders and I’m hoping Genesis goes further down that road instead. Woot!!!! Ever since WP decided to change the color palette picker to no longer include the ability to save custom colors, it has been a real pain for me to put my signature red on bold text that I want to stand out in a post. Well, that can be fixed in Gutenberg!! Bill Erickson gives designers all the code they need to register custom colors for both text and backgrounds. He also has all the code you need to style buttons with Gutenberg too. Last week I told y’all how much I love the folks at Foo and the things they make. I’ve been using the FooGallery plugin on the wood site for years. And now I see that the Pro version also lets you make galleries of YouTube videos. So, you bet I’ve got this on my purchase list for making categories of videos easy to find for the different types I’ll be making. I think this is going to look so much better than embedding a YouTube playlist. It will be much like some of y’all do for your recipe categories. They very much look like a Pinterest board instead of just a list of titles and links. Great post! I’m very interested in SEO for videos so I hope you do the new course. I’m really enjoying the SEO Workshop and have learned so much already. I’ll be taking notes as I finish setting up the YouTube account for Heartwood Art, as well as what I do with the video itself. And that will be the first of the course. I do well on BlogAid as far as views, especially due to the SEO, but not as many subscribers as I’d like. I think folks get the help they need and just leave. I suspect that will be different on the wood site. And, betting it would be different if I had a regular schedule of tutorial videos for BlogAid too, which I hope to do this year. So excited to hear that you’re going to do more WordPress plugin advice. BlogAid is my go-to source for help in choosing the best plugins, but there are so many out there that look great and really aren’t. Knowing which plugins would hog resources or slow my site is priceless. I already have a recommended Plugins page, but it doesn’t get enough love from me or the site visitors. So, looking to approach this in a different way that makes it easier for my to maintain and y’all to find. Another rich post. First, thanks for the shoutout about Irina Leoni’s smartphone photography webinar. And, I’m looking forward to your plugin review! I’m stoked about the photography webinar and so appreciate you calling on your buddies to help us!! I guess I need to get on the video bandwagon. I am at below first base in knowledge so I look forward to all you have to offer. I only have like 32 posts on YouTube. When I went there today to chek on some of them I was shocked to see 56 followers and hundreds of views! The only promotion I do is a follow button on the blog. I guess I need to concentrate more there. Thx for the push to move on it. I’m getting that same reaction from a lot of folks about jumping on the video bandwagon. There are so many ways to do it that don’t require you to be on camera too!! Denise, if you intend on switching/revamping your theme soon, or want to play more with Gute, then keep the sandbox. It will be late in March before I release a course on it.